It has to be said that the current crop of national intelligence chiefs are cut from the same cloth as their predecessors and THEY LIE. THEY TELL PORKIES. Donald Trump is right and they are wrong. But he is wrong to believe (HE DOES NOT, BUT TO SAVE THE FURNITURE HE HAS TO APPEAR TO BELIEVE) that they are "mistaken" or "faulty". 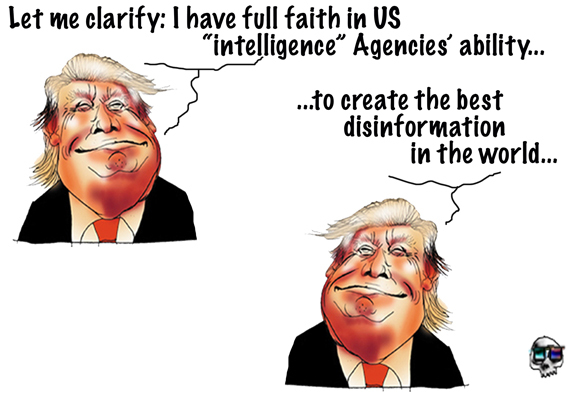 There is no such a thing as "faulty intelligence", but there is DECEPTION. In previous cases this deception was to satisfy going to war under faluse pretences, in the case of Donald Trump, the deception is designed to stop him to seek PEACE. If you’re anything like me, you’ve been absolutely apoplectic this past week watching the United States orchestrate a coup in Venezuela. It has been truly horrifying to watch these things play out in real time. How bold and brazen these thugs have become! They are doing this right out in the open, they hardly even try to hide it. Sure, they try to whitewash it with their typical propaganda. They obfuscate key facts. They paint Maduro as a criminal. They pass around cheap slogans. Where once we heard, “You’re either with us, or you’re with the terrorists”, now it’s, “either you stand with the forces of freedom, or you’re in league with Maduro and his mayhem”. It’s disgusting. It’s disgusting and horrifying and saddening, but if there is one thing we gain by watching this tragedy unfold, it is a certain clarity about the state of affairs in the world. It makes it clear that conflict is inevitable. I’m not talking about conflict in Venezuela, although conflict is likely to unfold there too, I’m talking about a much larger conflict. I’m talking about a global conflict that must eventually occur between two ideologically incompatible groups. There is one group of people which considers war both necessary and routine. Some members of this group make their money building and selling bombs and guns and tanks and missiles. These people need wars, otherwise they don’t make any money. Other members of this group make their money by taking and selling the natural resources of other weaker nations. These members need wars to ensure they get easy access to the resources they want. Other members of this group make their money enslaving the poorest people in these subservient conquered nations, putting them to work in factories with inhumane working conditions for inhumane wages. Other members of this group are facilitators, working in government or media. They plan, organize, fight, and sell these wars to a largely unwitting public. All these groups of people have formed a close knit coalition, working together to control and exploit the people of the world for their own collective material gain. Speaking before the Senate intelligence committee on Tuesday, Haspel said that Iran was fulfilling its obligations under the nuclear deal, which Trump has repeatedly blasted as a "one-sided and terrible" agreement. Coats, for his part, stated that Daesh* remained a threat — an observation that appears to contradict Trump's statements that the US had crushed the terrorist group in Syria. The following day, the White House cancelled the daily briefing, while POTUS hit Twitter with a lengthy message, saying that "perhaps intelligence should go back to school".